Selling a home is one of the biggest events of your life. Getting the best price for your home means having more money to invest in a new home and moving forward in a significantly better financial position. The key to getting the best price for your home is to have it appraised at the highest value possible. One way you can do this is to deep clean your home. When an appraiser looks at your home, he or she looks not only at the permanent aspects of the home, such as the walls and roof, but also at the appearance of your home. This may seem unfair. You are not selling your possessions. The appraiser looks at the home through the eyes of potential buyers and appraises the home based on the appeal to buyers. This includes how clean the home is. Below are a few easy but powerful ideas for making the best impression on an appraiser. Some cost only time and none cost more than a few dollars. With a bit of elbow grease and a small monetary investment you can greatly increase the value of your home. Changing light bulbs is not technically cleaning. It will make your home look fresher and more sparkly. Choose the highest wattage each fixture can handle. Avoid the soft white bulbs that put out less light. Choose daylight bulbs that brighten the room and provide a more natural light. If this is the only thing you do, your home will immediately look better. If your microfiber couch has had one or more encounters with spills it may have stains you despair of removing. Most will come out with isopropyl alcohol. You will need a white sponge and white bristle brush to apply the alcohol and some elbow grease. Use a white sponge or cloth and a white brush because colored tools may bleed color onto the microfiber. 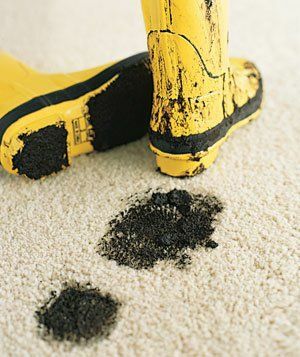 If you have a mystery stain, or several mystery stains, on your otherwise nice carpet, you can remove them easily with your household iron. Use the steam setting on your iron or place a damp cloth over the stain and iron over the cloth to steam out the stain. Oil based stains do not respond to steam, but will come out easily with a solution you can make in your kitchen. Scrape up any liquid if the spill is fresh. Then sprinkle baking soda or corn starch on the stain. Allow this to set for 10 to 15 minutes. Vacuum the baking soda or corn starch up. Create a solution of two cups of warm water, one tablespoon of clear dish-washing liquid and one tablespoon of white vinegar. Use clear dish-washing liquid to avoid color bleed on the carpet. Using a white cloth, blot the stain with the vinegar and detergent solution. Rinse the area using a sponge and cold water. Blot dry, and your stain will be gone. Whether you have kids who forget to use coasters or a thoughtless guest left a ring on your best end table, you can remove the ring and the bad impression it leaves on the mind of an appraiser. Aim a hair dryer on its hottest setting at the water ring. You may have to hold the hair dryer on the ring for as long as half an hour, but it will slowly disappear. When you’ve removed as much of the ring as possible with the hair dryer, rub a small amount of olive oil into the word to moisturize it. Your wood surface should be as good as new. When you’re deep cleaning your air conditioning unit is probably the last thing you think of. Maintaining your outdoor and indoor units makes your air fresher, improves the efficiency of your air conditioning system and will show an appraiser that you take excellent care of your home. You can find instructions for air conditioning system cleaning and maintenance at Family Handyman. If you’ve ever looked at the filter vents under your stove hood, you probably never want to look again. Your appraiser will look. It’s easy to surprise your appraiser with shiny vents. The Manly Housekeeper explains how to easily remove grease and then bring the filters to a shine using a homemade solution, a toothbrush and some elbow grease. There are dozens if not hundreds of things you can do to deep clean your house and leave a good impression on appraisers and potential buyers. These six are a good place to start. Information Credit to Fabricare Cleaning Professionals, a Barrie, Canada Carpet Cleaning Company.